Rays of light peaked through blinds hitting the face of the room’s occupant, Shinichi, causing him to stir from his slumber. A hand went up in an attempt to block the rays, a futile action, trying to get more comfortable and return back to sleep, Shinichi twisted and turned in the bed. He was tired, incredibly so. The activities of the prior night being more draining than he previously thought. Having gotten comfortable, eyes close once more as he attempted to meet the sandman. A few minutes past with him getting nowhere closing to sleeping. With a frustrating sigh, covers and blankets were tossed to the floor as he decided to start his day. An involuntary shiver couldn’t be stopped from running down his spine when his bare feet touched the wooden floor. Having lived in the house for the entirety of his life, one would think he would’ve gotten used to the coldness of the floors, nope. He still, and probably never will, get used to their coldness. Shoving his dislike for cold floors to the further part of his mind, Shinichi went about straighten up his room, starting with the bed first and moving throughout the spacious area, picking up and placing various objects in their rightful places, like he did ever morning. A knock at the door, his mother telling him, it’s time to wake up, and, breakfast was being prepared ready, and with him replying according. Moving across the room, Shinichi disappeared into the bathroom and began his morning ritual of showering, brushing and flossing teeth. Ten minutes later, Shinichi exited the shower, moving to clothing laid out on a chair and putting them on than exiting his room - heading down to eat breakfast with his parents. Breakfast was a quiet affair. The conversation was kept to a minimum with the family only talking about their plans for the day. Shinichi didn’t make plans to do any missions, having wanted to train in his Kekkai Genkai with his parents. However, that wouldn’t be happening, the parents both had engagements that they must attend, basically the Chi elders summoned them in and being a part of the clan they must answer. Shinichi didn’t particularly like the Oni Elders. From the few times, he has been around them, and from what he had heard, they were a bloodthirsty bunch who tip-toed the line of respective elder and common thug on a daily basis. Despite his dislike for them, he couldn’t do much about them, there was a perfect reason why they were the elders. Hugs, handshakes and farewells were given, Shinichi been on the receiving end of them as his parents left the house. A comfortable silence fell in the home as he went about washing the dishes before leaving the house, checking to make sure everything was in order beforehand. Still being quite early in the morning there weren’t many civilian out, only a few had already opened their vendors and started their day, others were just now doing that. Walking down the street, Shinichi opted not to wear shinobi attire, having no need for it, instead he wear civilian-esque clothing. A short sleeve grey shirt with white Konoha’s leaf symbol printed on the back, black windbreaker style pants, and matching Jika-Tabi. Moving through the streets, Shinichi walk further away from the market place and straight towards Konoha’s dense forest. Big. The only word to describe the forest, Shinichi couldn’t fathom how big it truly was. Shaking his head, he headed into the forest, bypassing different types of vegetation and animals that were scurrying about. Reaching a relatively large oak tree, Shinichi used super surface walking to walk up the trunk of the massive tree. Upon reaching the second branch, Shinichi laid against the trunk, his body balancing on the second branch, right foot dangling lazily. He didn’t know why he came out here, he just did. . .Maybe the venture out here wouldn’t be fruitless. Suki sat upon a tall tree admiring the woods. The tree as a grand oak, quite an impressive tree. The forest was indeed dense, and this grand tree was a way out of the canopy. Suki sat on one of it's uppermost branches, in a spot barren of leaf coverage directly above her. This allowed the sun's rays to hit her. The slight breeze created the soothing sound of wind. The rustle of leaves was adding to the sound, and the swaying of the grasses and plants that managed to grow in such a dense forest joined the leaves and the wind. The sound it created was soothing. The kind of song one would listen to if they wanted to relax or sleep. Suki's ears pivoted and twitched as various sounds met her ears, mostly a nearby tree limb creaking or an animal snapping a stick. No doubt deer inhabited these woods too, the senseless offering perhaps more protection from predators. Then again, it was perfect for some predators.... Felines namely. But Suki doubted leopards ran wild in Konoha's woods. As it was, She might be the only feline in the area. Perhaps a stray cat might wander by? Who knew. At any rate, Suki was content. The sun warmed her fur and the wind stirred it into motion. It was short fur, so fortunately it wasn't waving all over the place. But it moved. It swayed like a field of tall grass in the wind. Her fur was a yellow-Orange, with black markings. Suki stood 16 inches tall at the shoulders, and from Her chest to the base of her tail was 2 feet 2 inches. This made her quite a large cat. Overall, with the Sun warming her fur, and the breeze stroking her pleasurably, she didn't move when something landed on a branch below her. Her ears twitched towards it, but She was in no hurry to move. Her tail, more than 2 feet long, wished back and forth lazily, another sign of her contentment. After a moment, she began to purr contentedly. She was in a happy place. She loved sunbathing, being stroked, being somewhere high, and reading. She lacked a good book, but 3/4 was more than satisfactory. She prefered being petted to the wind caressing her, but they were similar sensations after all. Her purring increased in volume, not too loud, but probably enough to be heard a few branches below her. Everything was going well today, and after staying up part of the night, the sensations were almost enough to put her to sleep. Only a vague curiosity about that sound below her she had heard a bit ago kept her from drifting off. However, she didn't want to move just, Only to find whatever it was gone. Suki let out a soft, contented meow, and resumed purring. What else would this day bring? Maybe she would go fishing later? Or swimming. Suki loved swimming. She had an odd love hate with water. She loved swimming, but fast moving water made her nervous. Floods and such freaked her out. She was also mildly afraid of suiton jutsu. He could think up a logical reason for venturing into the forest surrounding Konohagakure no Sato. The wildlife and local flora while interesting didn't pique his own curiosity at the given time; sure, there might be some fascinating specimens just waiting to be discovered out here, he wasn't a biologist nor a botanist, and therefore, anything about local wildlife and flora didn't concern him. The Academy had made it mandatory for the genins to have some basic knowledge of Konoha's local ecosystem, wouldn't look good on the Hokage, or council for that matter, if a promising genin got hospitalize for eating a native plant; not knowing it was poisonous. Therefore, it's required for all genins to have at least passable knowledge about the wildlife and plants in Konoha. So it is not like he lacked knowledge about the inhabitants of the surrounding forest, he just didn't care to exercise that part of his brain at the moment. Shinichi shifted a little on the branch causing it to move and the leaves to slightly rustle. His right leg dangled freely, tapping on an invisible platform as his toes hugged his ninja sandal's thong in order to keep the footwear from falling to the ground below. Eyes lidded half way, body relaxing as a light breeze caressed his cheek bringing a small, serene, smile to his face. The expression was more tamed than the ones showcased during moments of bungee jumping, snorkeling, or during any other extreme sport. Lacking excitement, the smile radiated contentment and peace; a far cry from the usual one plastered on his face. Is that purring, he thought, straining his ears to see if he can hear it again and determine the direction it was coming from. It took a few seconds to hear the distinct noise again, and he was able to confirm it indeed was purring of a cat. Now where is it coming from? Scanning the branches on his level and below, Shinichi couldn't find the feline anywhere. Not spotting it in his initial search, Shinichi looked upward. If it is not below him than could it be above him? Sure enough, a few branches above him was a cat who looked to be sunbathing. 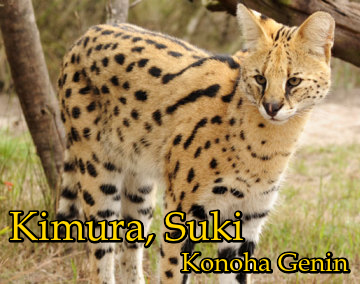 Squinting his eyes, Shinichi took in the feline's appearance, noting how it was slightly larger than a domestic cat but smaller than most 'big cats'. Humming to himself, Shinichi pondered on his next course of action. . .
She heard movement below her again, she wasn't sure what it was, but shortly afterwards she heard someone. Someone calling a cat. Suki yawned again and turned, looking around and below her. It was hard to miss the boy sitting on a lower branch, his red hair stood out from the greens and browns that made up the colors of the tree. He was calling her? Suki looked around to verify the absence of another cat. For some reason her mind wandered to a recent encounter with a prior raikage. He had said she was human in all the ways that mattered. Paraphrasing of course, but it had been Something She was glad he had said. That didn't mean she wasn't a cat of course.. Suki nodded to herself and jumped down onto his branch. Suki looked over him hesitantly and gave a cautiously friendly meow. Being able to speak human language(s) didn't mean she had to do so constantly after all. She held her tail high in the typical feeling friendly greeting body language, with her head turned slightly to one side, indicating friendly curiosity. Who was he? Where had he come from? Clearly those noises had been him. He didn't appear overtly threatening, and that was good. Sukigace a slight smile and looked him over without speaking. There wasn't a need just yet in her opinion. Besides, it might freak him out. So sorry I have been having problems, my dad's frequent hospital visits... After all that I half forgot about this place for a week or so. Buy I am back and ready. Please forgive me for the stupidly long delay and the short post.